Sydney's big race of the spring, the $1m Group 1 De Bortoli Wines Golden Rose Stakes, takes place tomorrow at Rosehill. The sharp fellas at Premium Punting (@premiumpunting, website) have taken the time to share their expert preview of the big race. Even if Aussie racing is not your bag, take a look at the detail and analysis they use to form their preview - important elements of form study to improve your punting! tomorrow at 4:25pm Sydney time, 0725 London. Analysts are faced with an immediate conundrum as 9/15 come out of the same race that was on a heavy surface and only Bachman who resumes didn't compete on a heavy rated track at their last start. Rosehill has had quite some time to dry over the past few days and the weather on the day predicts no showers, so by this race we may have a Dead 5 or Slow 6 at the worst. Speed looks to be a moderate gallop, not overly quick but the front runners will not be granted a holiday at the front. There is unlikely to be much change from their positions in the Run To The Rose. Despite fading poorly, jockey Jason Collett has no other option than to cross the field and lead with Yrigette again on his heels. Almalad faces a challenge, more so does Tommy Berry. Gai won't take any chances and will more than likely give Tommy instructions to race very handy, however the two jockeys drawn on his immediate inside will ensure that he isn't granted the run to slot in front of them. The barrier position of Bring Me The Maid, although appearing suitable, can potentially be detrimental to her winning hopes shall she not jump well which she does have the tendency to do. The possibility looms for her to be back and wedged waiting for a run. But provided she is well away it would be unlikely she concedes too much ground. Hearts in mouths for backers of her in the first 50m. Expecting the old Almalad to return, for a horse with only four career runs the term old appears strange but the difference between his last start performance figure and what we saw when he won the G1 J.J.Atkins look like a different horse. He was depleted carrying 60KGs on that bog ground last run and the vet also found him to have "aggravated superficial abrasions to the off hind cannon." Provided the track is no worse than a Slow 6, he is going to return to his near peak which is good enough to win. Do your shopping and you will be able to back him as an overlay - track the key so pay close attention to the rain radar. Despite conceding Bring Me The Maid 2KGs, the current difference between himself and her is inaccurate. He bloused the field easily in the Run To The Rose and her final 200m sectional time was quicker than that of the fillies. Again, she has drawn wide but doing so over 1400m races at Rosehill is of no concern and jockey Hugh Bowman will have no reason to panic cornering as he can patiently wait and then accelerate - he has the horse to produce the fastest finish. His performance rating spiked when presenting second up last campaign and the Cummings are most patient with their horses upon resumption, so we can expect that he may have further improvement into this than his counterparts. Was most gallant in defeat to Hallowed Crown last run in his return from a spell. Settled well back after being slightly awkward away and then he really did attack the line. His career PB was when he ran third in the G1 Champagne Stakes over 1600m, thus, an expectation for him to return a better performance over this 1400m trip has merit. Importantly, he has drawn an inside gate and we anticipate that jockey Kerrin McEvoy takes the trail behind Nostradamus and follows his pth in to the sprint. Provided the rail is of no disadvantage, he is in for a cheap run. As mentioned before, her speed map is of a concern and it is a surprise to see her backed early in betting. Of course, with even luck she is most capable of winning this race; she is already a G2 winner and an excellent 3rd in the G1 Golden Slipper. But she faces adversity from her mid race position and her trainer Peter Moody, as honest as he always is, has indicated that there is nothing between her and stable-mate Better Land in track work. Long term you will be in front taking on favourites with a speed map that she may have shall she begin awkwardly. The market shown is set to 100%, eliminating horses priced over $20. Premium Racing Services clients get a market <100% to gain a wagering edge and to help find the stronger overlays to be wagered upon. Follow our market closely in comparison to the public's throughout the day, feel there will be a bit of change and we will get a perfect gauge on the track. 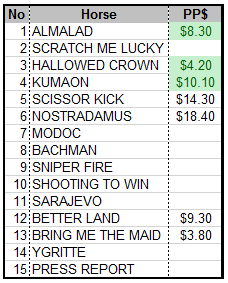 At this stage, a Win bet Hallowed Crown and place ticket on Kumaon and play close attention to the track condition, happy to back Almalad if no worse than slow 6.